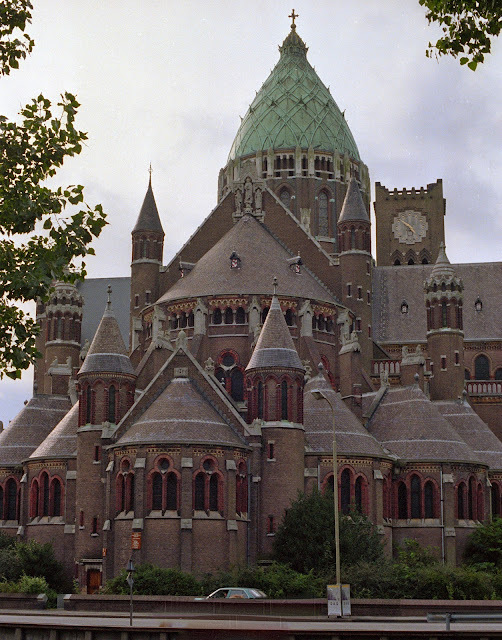 Catholic Cathedral St. Bavo in Haarlem - not to be confused with St. Bavokerk in Haarlem - is an elaborate hodge-podge of turrets, domes, and towers built mostly out of brick in 1895. Victorian, art deco, and even Gothic styles kind of blend together to create this enormous basilica that seemingly cascades into the Leidsevaart canal just southwest of the city center. Haarlem, the Netherlands, is a small town just outside Amsterdam that serves well as a home base for exploring not just Amsterdam but other nearby cities. Hotels in Amsterdam can be expensive and the city can get crowded, so on several occasions I have opted to stay in Haarlem. Trains depart from Haarlem for Amsterdam every 6 to 9 minutes and the ride is a short 10 minutes. Check out more travel photos at Photo Friday at DeliciousBaby.com. What a beautiful cathedral - I love finding out about these amazing places outside the big cities! Not just to explore the cities - Haarlem is smack dab in the middle of tulip country! Beautiful. How I wish to visit someday there. I love this Cathedral. Whenever I visit Haarlem I never forget to visit that place and make a pause for some time to pray.